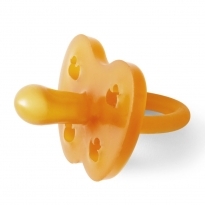 Pacifiers or soothers, some babies just love them! Here at Babipur we have a selection of natural rubber soothers made from real rubber from the Hevea tree. Pacifier chains and holders are also super handy stopping your baby's soother form falling on the floor every time they drop it. Wooden pacifier holders are great for inquisitive babies who like to grab and play with the beads, they can also be handy for teething too. Hevea, Haba and more eco friendly brands.